Standing in front of Michelangelo Merisi da Caravaggio’s epic 1608 masterpiece of The Beheading of John the Baptist can be an experience all on its own – one that can send chills down one’s spine and make one’s arm hair stand on end. The Beheading of St John the Baptist, Michelangelo Merisi da Caravaggio’s 1608 masterpiece in the oratory of the cathedral. The painting was always intended to be the altarpiece of the cathedral oratory, which literally means ‘a place to pray’. The oratory was also used for the instruction of novice knights and to hold tribunals, for example, on whether to defrock a knight. It used to be looked after by a confraternity dedicated to care for imprisoned knights awaiting their death sentence. The painting shows people dressed in contemporary 17th century clothing, not that worn at the time of John’s beheading, signifying that this event is happening now. It reflects themes of both indifference and mercy. While the jailer, the young woman and two other prisoners looking out of a window are cold and impassioned, the old woman covers her ears so to not hear John’s screams and her face expresses pity. And the executioner is about to withdraw from a holder around his waist a dagger, known as il coltello della misericordia (the knife of mercy) with which to put the victim out of his misery, for the sword on the floor evidently did not do a perfect job. 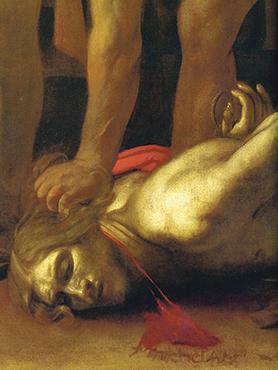 The chiaroscuro light effects of the painting help visitors focus on the two most important figures in the painting – St John and the executioner. The painting is almost biographical. 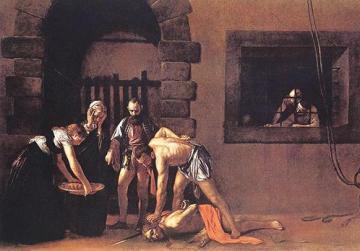 Caravaggio had come to Malta to escape justice after he had killed a man in Italy. And in those days the punishment for murder was death by beheading. He was a wanted man. He came to Malta because he knew the Order of St John was here. And he was told the only chance for him to be forgiven was if the Pope himself forgave him. But how could a humble artist ever hope to receive the Pope’s forgiveness? The answer was: by becoming a member of the Order which served the Pope, and offering his services as their court painter. The painting is Caravaggio’s tribute painting to the Order. It is the only one he signed, albeit only with his first name: ‘F. Michelangelo’. Whereas most artists would sign their painting at the side, almost hidden, Caravaggio signed this painting in the blood oozing from St John’s neck, in what can be considered the purest part of the entire painting. There are various interpretations for this. He could be saying: F for Fra, meaning knight; Caravaggio had been accepted as a member of the Order. ‘F’ could also stand for fecit – as if to merely say: “Michelangelo created this painting”. But it could also mean “Michelangelo caused this blood”. But why would Caravaggio have, as it were, dipped his finger in the blood of the Baptist and written his name in it? Was Caravaggio trying to leave a clue written in the victim’s blood as to who his killer was? In the painting there is also a parallel between the sacrifice of John and that of Christ. Partially hidden underneath the victim’s clothing are two woolly legs, signifying a sacrificial lamb. If one draws lines extending horizontally from the bottom of the window and vertically along the door in the background, they would form a cross intersecting at the executioner’s dagger. And the executioner is wearing a white cloth, similar to that usually worn at one’s baptism. So the message to us is: even killers can be reborn and saved. Christ’s sacrifice has redeemed all man. Even the rope on the side of the painting that was used to tie St John has significance and a message of hope. It lies cut on the floor. It can no longer bind him to the earth. But the other end rises up and out of the painting… still connected to God. Pietre Vive, literally meaning living stones, is an international association of lay volunteers in Europe and beyond, who, inspired by Ignatian spirituality, learn about the deeper meanings and messages behind the paintings and sculptures of churches within their respective countries and then offer their services free of charge to guide individuals or very small groups of people to ‘encounter’ this sacred art. The local group performs this voluntary service at St John’s. To find out more about the initiative, e-mail pietrevive.malta@gmail.com or segreteriepietrevive@gmail.com.